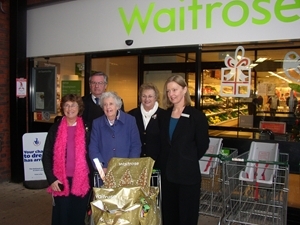 The Waitrose Trolley Event was won by Mrs Joe McGregor of Buckden who estimated the total value of the contents of the trolley most accurately. 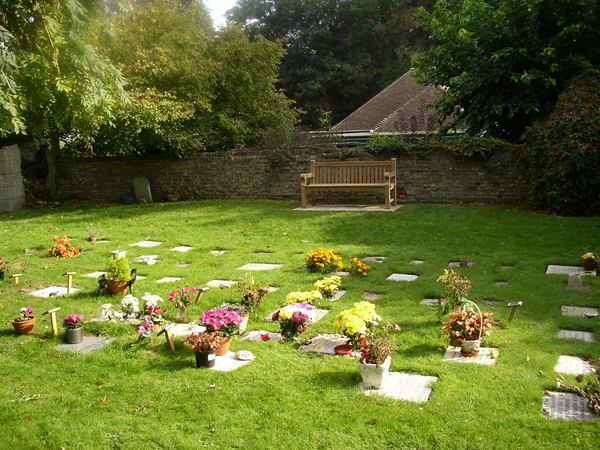 Almost 800 people paid �to enter and the total raised for charitable purposes was �3. The Rotary Club of Huntingdon is most gratelful to Waitrose for their support for this event and for their very substantial contribution to the contents of the trolley. 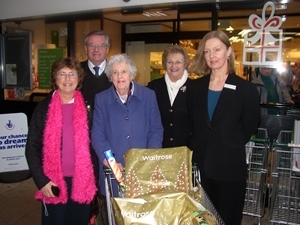 Our picture show, from left to right, Maggie Galan, President of the Rotary Club of Huntingdon, Rotarian Mike Baker, committee chairman, Mrs Joe McGregor, Rotarian Anne Dear, the clubs liaison officer with Waitrose and Cara Mathewson, Manager, Personnel at Huntingdon Waitrose. 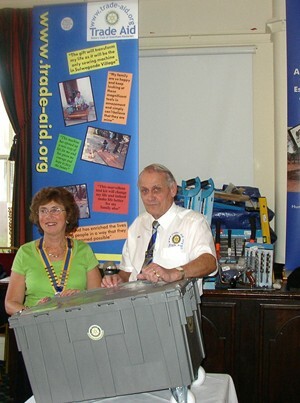 John Asher, of the Rotary Club of Grantham Kesteven gave an inspiring talk on Trade Aid Boxes, a charity which he has been entirely instrumental in launching since his retirement only a few years ago. Each box contains a carefully selected, comprehensive range of brand new tools and equipment suitable for a business to re-start after a disaster. Businesses include teacher, builder, carpenter, blacksmith, mechanic and seamstress and boxes also include a wind-up lantern and first aid kit. It costs �9 to completely fill a box and send it to wherever the need. The Club was honoured when Louis Smith, Olympic Bronze Medallist, Paul Hall, and Daniel Keating visited on 20th November and presented the wonderful photograph of Louis in action to our President Elect Geoff Burniston. In the BBC Eastern Region Sporting Personality of the Year Awards Paul won the 'Coach of the Year' award and Daniel Keating the 'Young Sporting Personality' award. 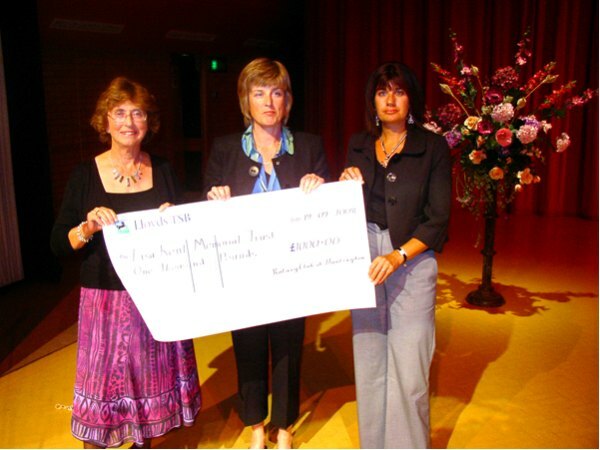 The Rotary Club of Huntingdon presented a piano recital by Alexander Karpeyev on Friday 19th September 2008 at Hinchingbrooke Performing Arts Centre. 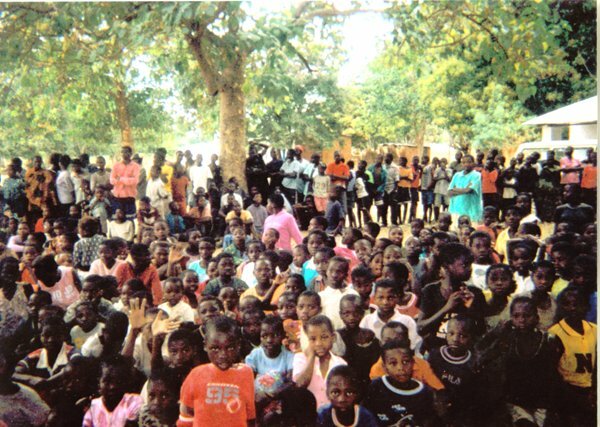 The main charitable beneficiary of this event was the Lisa Kent Memorial Trust, a charitable organisation dedicated to providing the children of the Gambia with the education they need for a brighter future. 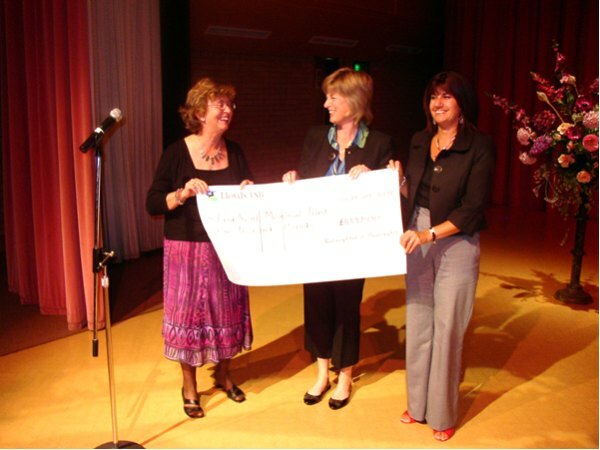 The Chairman of the Trust is Liz Tinkler and a cheque for �00 was presented to her at the end of the concert. Alexander Kerpeyev started playing the piano at the age of 7 and in 2000 he entered the Moscow State Tchaikowsky Conservatory. 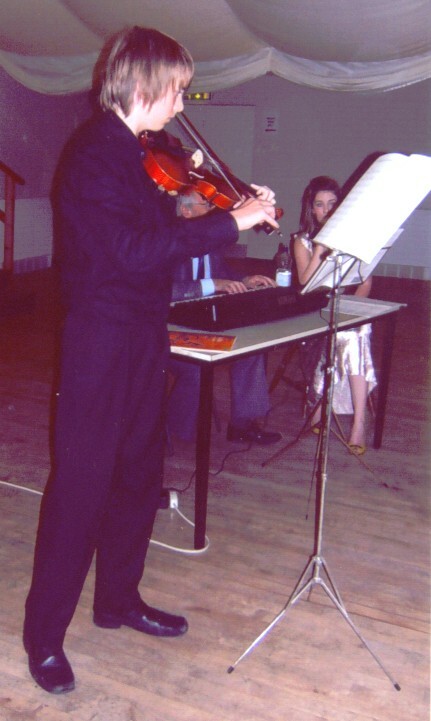 In September 2005 he won a scholarship to the Guildhall School of Music and Drama in London where he is currently a postgraduate student. He has given solo recitals all over the world and featured on TV and Radio 3. He has been a major prize winner in several international competitions and earlier this year won the Nora Sande Award, a competition for young pianists in the South of England, who very generously enabled this concert to take pace. 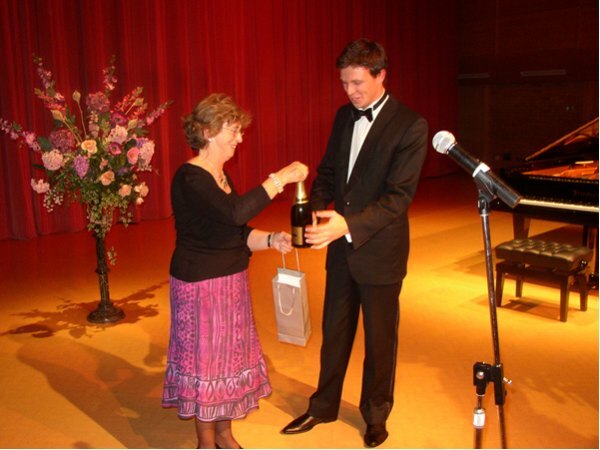 Our photographs show Maggie Galan, President of the Rotary Club of Huntingdon, presenting Mr Karpeyev with a bottle of champagne after his wonderful performance; presenting Liz Tinkler with the cheque for �00 and another photograph showing them with Jane Exton also of the Lisa Kent Memorial Trust. 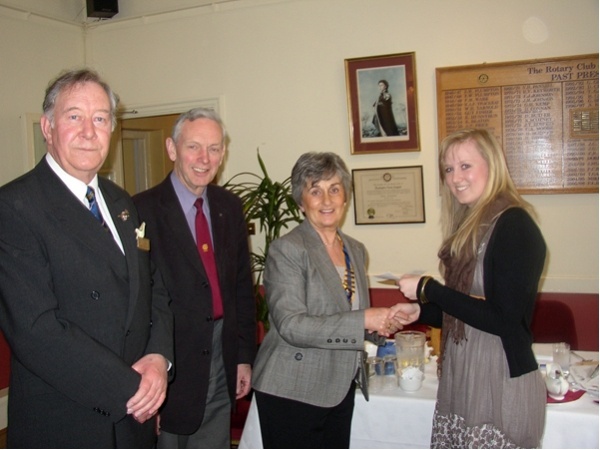 President Maggie Galan presenting a cheque for �0 to Ms Holly Price, optometrist and VAO Volunteer, at present a PHD student at Ruskin University. Ms Holly has visited Africa five times and will be going again this year. 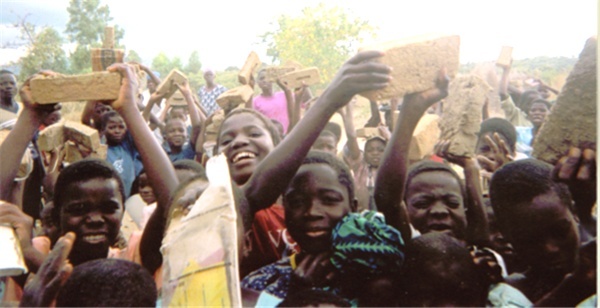 The charity is dedicated to the 300 million people in the developing world who are functionally blind and only need glasses to transform their lives. Organised by Rotarian Tarak Ghosh, a vast number of spectacles are collected by pharmacists throughout Huntingdonshire which the charity then recycle to many countries in Africa and also to India. 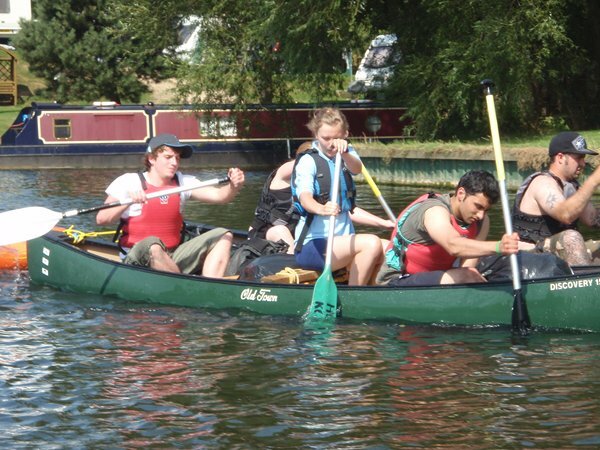 Rotary District 1070 held their 23rd annual Youth Leadership course at Grafham Water Centre. Rotary Clubs throughout the District sponsored 44 young adults, at a total cost in excess of �,000, who had been selected for their excellent potential for leadership. 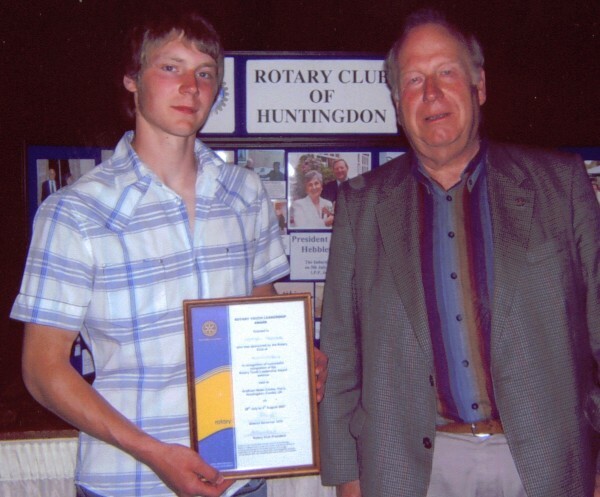 The Rotary Club of Huntingdon sponsored Luke Deal from Earith who is now going to Aberystwyth to study law. During the week's residential seminar the participants, aged between 18 and 26, undertook an extensive course in leadership training, team challenges and personal development including physical and intellectual tasks. Personal development and an insight into business and management expertise, leading to improved leadership skills. All the participants were identified and selected by their sponsoring Rotary Clubs as having the potential to take positions of responsibility and give leadership to young people within their own communities. Participants are placed into one of five groups at random, each comprising a tutor and nine young adults. 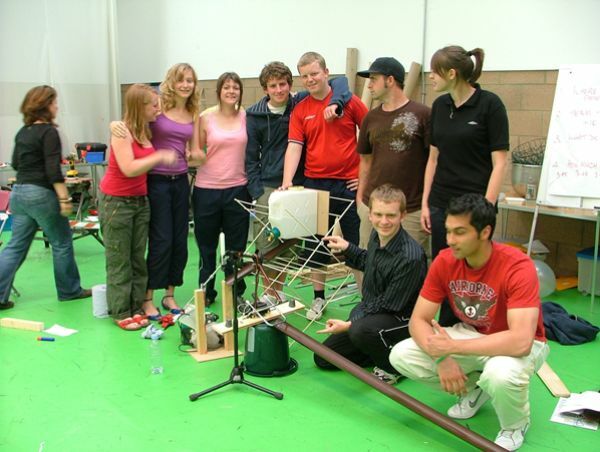 Throughout the eight day course, these teams competed in a computer generated business game, undertook a series of intellectual problems and initiative tests and completed a day long project set them by Tinderbox Consulting, to test their communication, leadership, resource management and team building skills. During the course, the participants received a series of talks on relevant topics such as assertiveness, listening skills, problem solving and different styles of leadership. 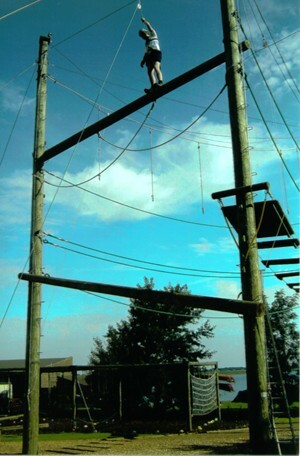 Team challenges include water sports, archery, climbing, high rope work, raft building, map reading (in the dark) and an overnight expedition in the open countryside. Both individual and team presentations are assessed throughout the course. Team tutors encourage discussion of positive and negative issues arising from those activities on a daily basis. 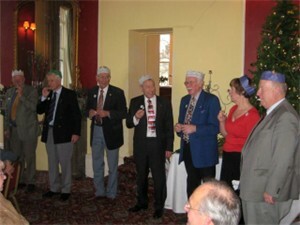 A formal dinner was held at the end of the course where participants provided the chairman, speaker and Toastmaster. Luke Deal gave an enlightening and entertaining presentation to the Rotary Club of Huntingdon following completion of the course. 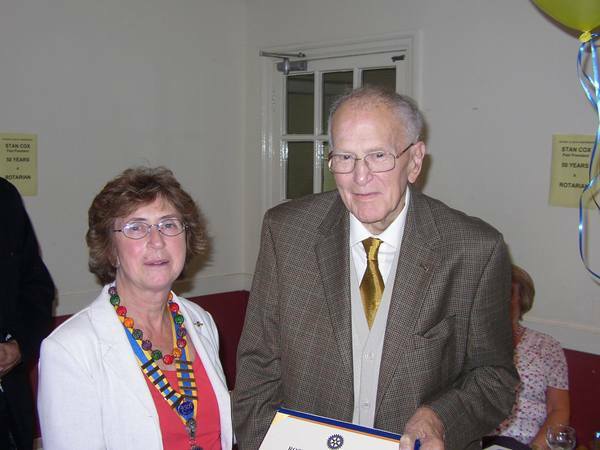 One photograph shows him being presented with his certificate of successful completion of the course by Maggie Galen, President of the Rotary Club of Huntingdon. Another shows him rowing and the third shows the team working together in a construction of a 'Honda Advertisement'. 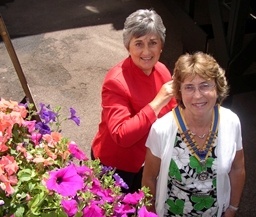 President Margaret Hebblethwaite installing Maggie Galan as President of the Rotary Club of Huntingdon for the following 12 months. 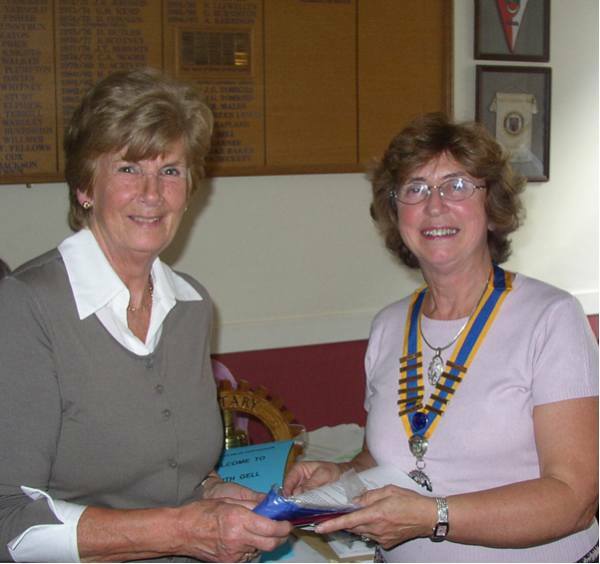 Maggie is the third woman President of the Club. 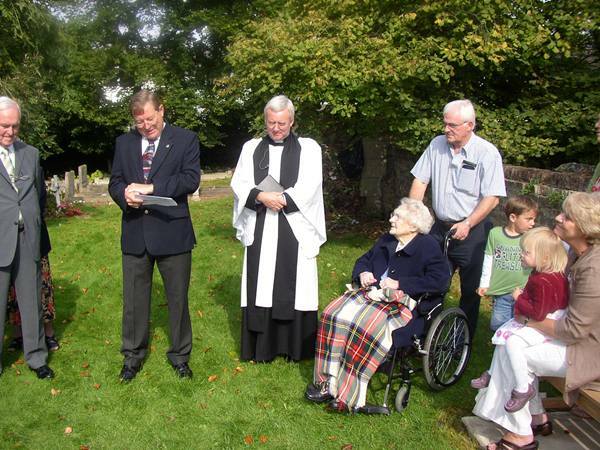 She is widowed with 3 grown up children and lives in Orwell. 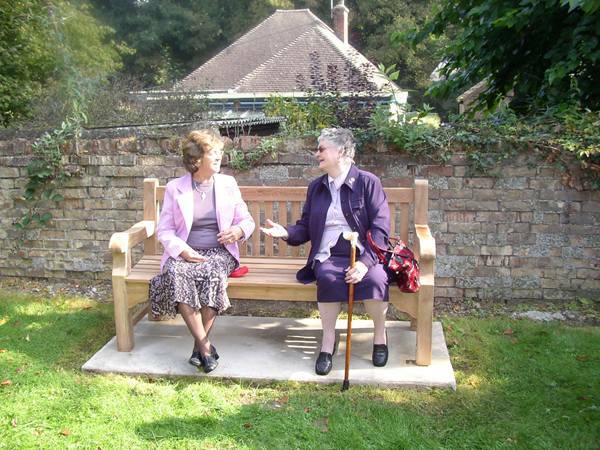 She and her husband bought Cromwell House, in Huntingdon, many years ago, renovated it and built 2 extensions to make Cromwell Clinic which she ran until her retirement 3 years ago. Maggie trained as a nurse at Guys Hospital, London, worked for 2 years in Zambia in the Flying Doctor service and then in the copper mines. Her special interests are music, travelling, gardening, animals and eating. Her goals for the club during her year as president are to raise even more money for local causes, contribute as much as possible to the International Fund to Eradicate Polio world wide, to enrol a few more members and to maintain a happy club with many interesting events and outings. 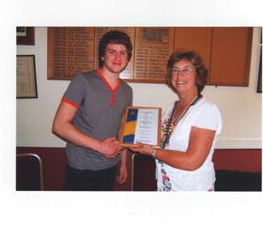 Daniel Keatings has been involved in gymnastics for 10 years at the Huntingdon Gym Club. This year he captained the British team at the Junior European Championships in Switzerland. He was awarded 5 medals, 4 gold and 1 bronze, for routines on pommel horse, parallel bars, floor exercise, team event and all round performer. Two weeks ago he was told that he had been selected to represent Great Britain at the Olympic Games in Beijing this summer. This award has been given to Daniel to mark his outstanding achievement - a local young man who is destined to do very well and we wish him every success. 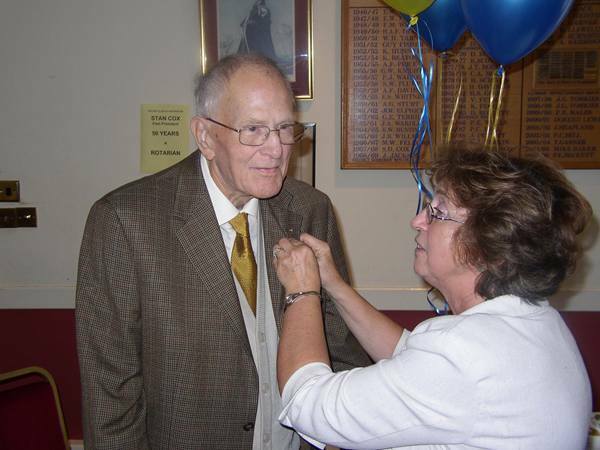 David Rollett was a distinguished Past President of The Rotary Club of Huntingdon who died in 2005. 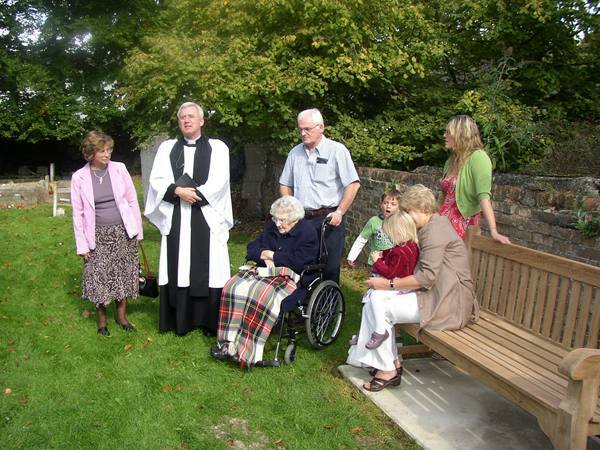 The award is an annual one funded by the collection raised at the service of thanksgiving in his memory. This is part of an ongoing programme of bursaries given to help young people to make full use of the facilities at the club. 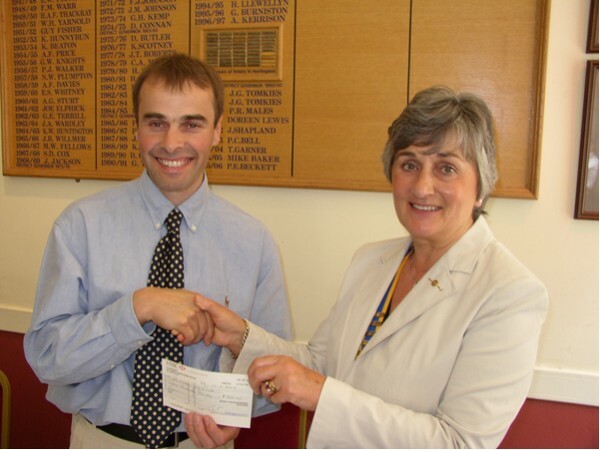 President Margaret presenting a cheque for �0 to Chris Donaldson, Area Coordinator of the East Anglian Air Ambulance. Air ambulance 'Anglia Two' covers Cambridgeshire and Bedfordshire and costs in excess of �7 million per year to run and depends entirely on fundraising and private donations. It is based at RAF Wyton. 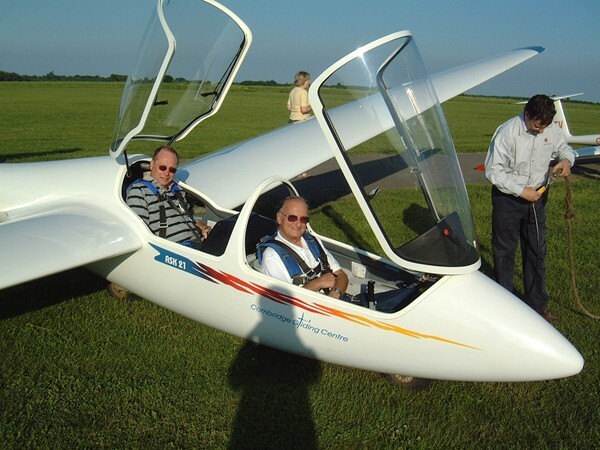 A chance to experience the joys of flying in a glider was organised by the Rotary Club of Huntingdon on the evening of Monday 9th June. Members of the Rotary Club, accompanied by their guests, had a truly memorable evening with excellent warm and sunny weather. Everybody was able to enjoy a flight with an experienced instructor from the Cambridge Gliding Club at Little Gransden airfield. The exhilarating winch launch was followed by the sensation of floating over the Cambridgeshire countryside on a calm spring evening. 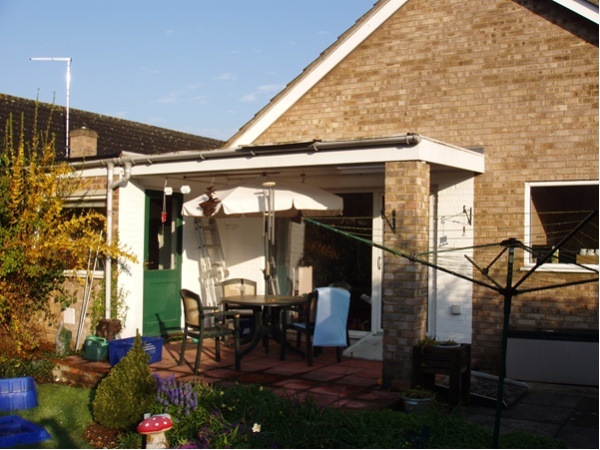 The excellent visibility provided wide views over the surrounding villages and Grafham Water. Visitors also had the opportunity to take control of the glider during the flight. 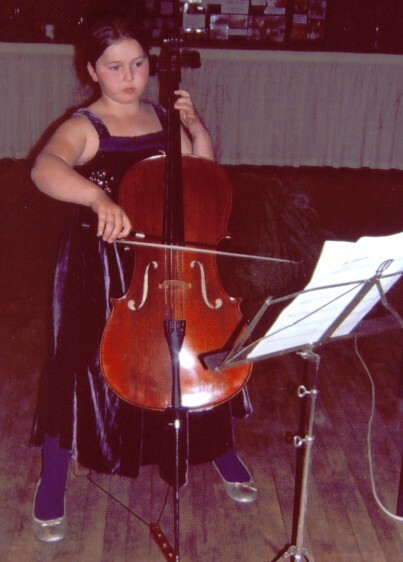 The evening included four musicians from Huntingdon Music School, Isabella Martin playing the cello, Jack Martin playing oboe, Sarah Champion singing and Jonathan Champion playing the violin. Lucy Franklin, supervisor of Young Carers, brought young carer Stephanie Dunkley and they both told us about young carers and some of their problems. 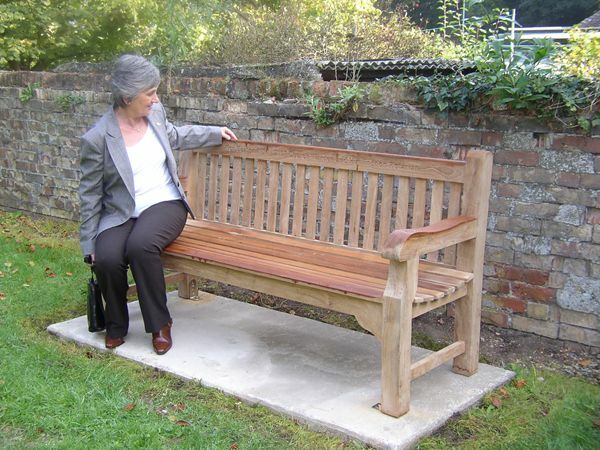 Mrs Anthea Kenna, Head of St.Anne`s School Godmanchester. "We had a good day at Melton Mowbray despite our early start (always a downer for us) with all four entrants performing at high level. The recorder ensemble won, the choir and vocal quartet were runners up and I'm not sure if Eleanor Owers was second or third. She was the youngest and the smallest by far. 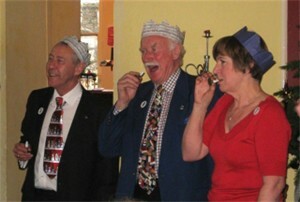 I thought the results were very fair except the adjudicators comment regarding the vocal quartet. He based his result on the movements of the winning group and their 'bopping' rather than the vocal/musical performance - which in the case of St Anne's was'sublime' in his words. this brings me back to an earlier suggestion of a category for Musical Theatre or Choreographed vocals to cover this sort of entry. As you are aware, I put a great deal of emphasis on 'proper singing' and whilst I incorporate an element of audience engagement and movement, I ensure that this does not detract from the musical performance. But as always I am aware that the adjudicators views are final and always have an element of subjectivity. We will be there again next year, I hope. I have that dates of the semi-finals already". 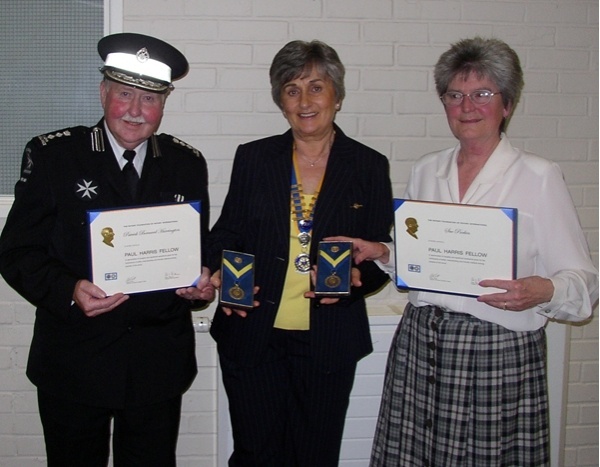 On Thursday Evening at the Foundation evening meeting Margaret presented Paul Harris Awards to Sue Parkin for her many years of community work and her years in Inner Wheel, including District Chairman and six times President of the Inner Wheel Club of Huntingdon and to Pat Harrington for his long and outstanding years of work for St John Ambulance in the Huntingdon and Cambridge Division. 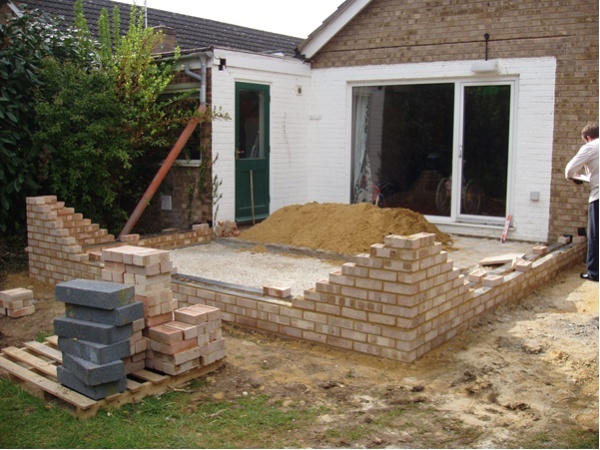 Photographs showing progress so far in the building of the Laurels conservatory. Arnt is a member of the Rotary Club of Kirkenes in the far north of Norway. He gave us 2 fascinating talks. The town has 6000 inhabitants, is 240 miles inside the Artic circle and has 2 months of winter darkness. The border with Russia is only a few miles away but can only be crossed at border controls. During WW II it was almost obliterated by bombing. 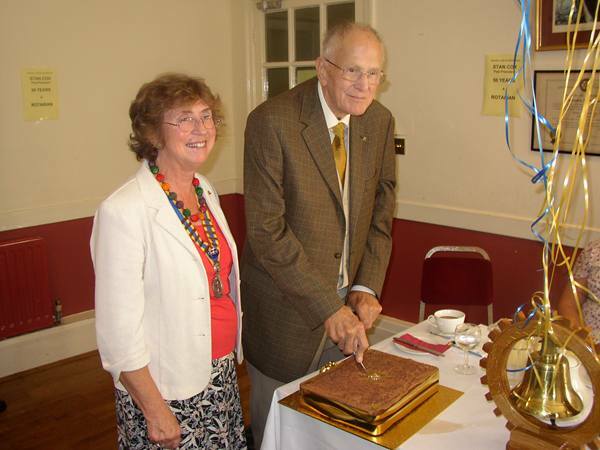 The Rotary Club was founded in 1952 and has 44 members from a very wide variety of nationalities. We hope Arnt visits us again. 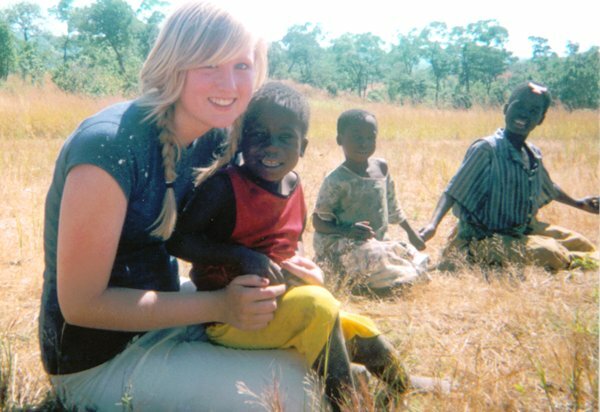 "Sophie Baker of Hinchingbrooke School was selected as one of the few pupils to attend this years program which seeks to provide schools and other amenities to the people of Malawi. 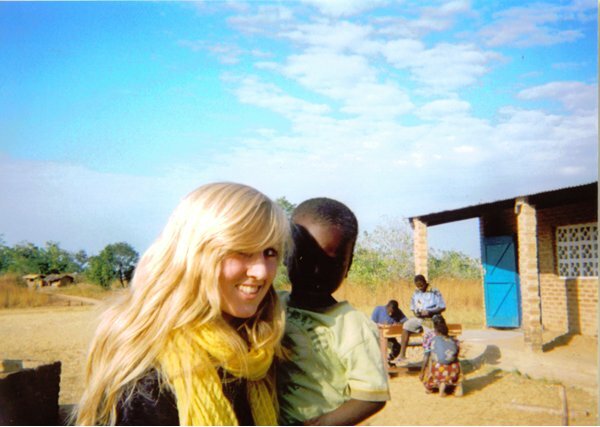 Sophie will spend a month in Malawi living and working in the community. 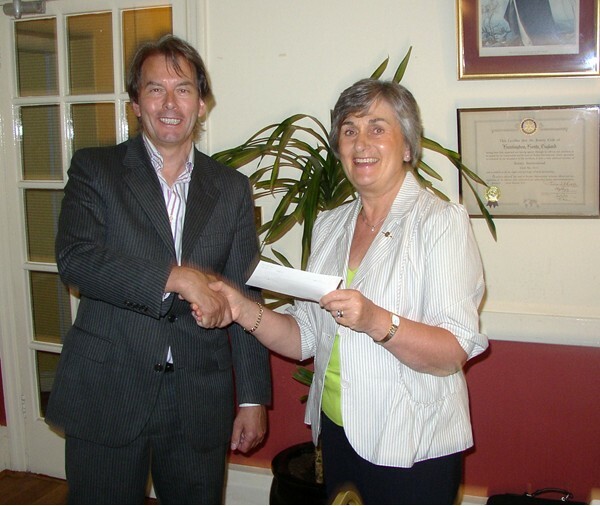 President Margaret is presenting a cheque for �0 towards the total of �00 that Sophie needs to raise to fund the program. 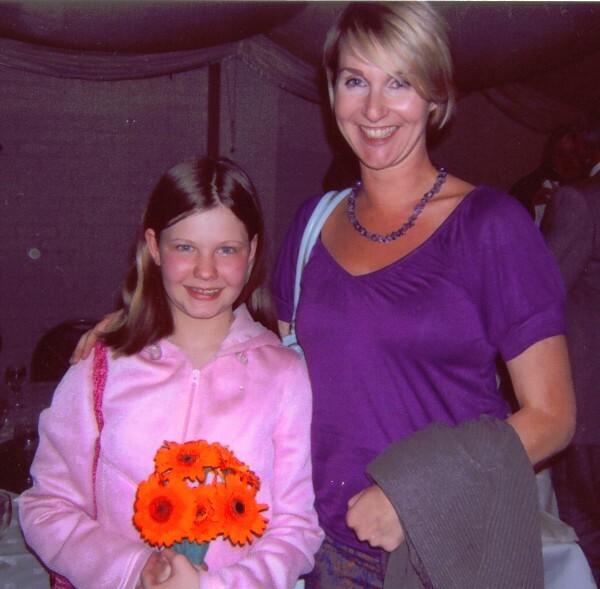 On her return Sophie will speak to us about her experience." 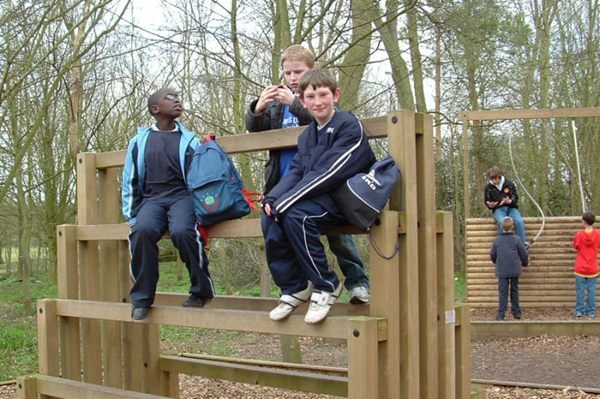 22 children from the Oxmoor Youth Centre and 13 adults enjoyed a days outing to Wimpole Hall organised by the Rotary Club of Huntingdon. Following a bag packing exercise just before Easter at Waitrose in Huntingdon the store very generously provided packed lunches for all. Attached are some photographs illustrating the day. 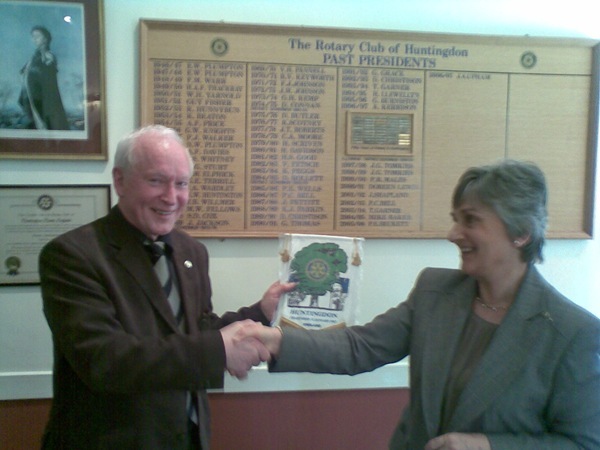 Dan Connan, PRO Rotary Club of Huntingdon. Bag packing at Waitrose on 20th March, the day before Good Friday raised a magnificent �8.89 as well as an opportunity to publicise Club activities. 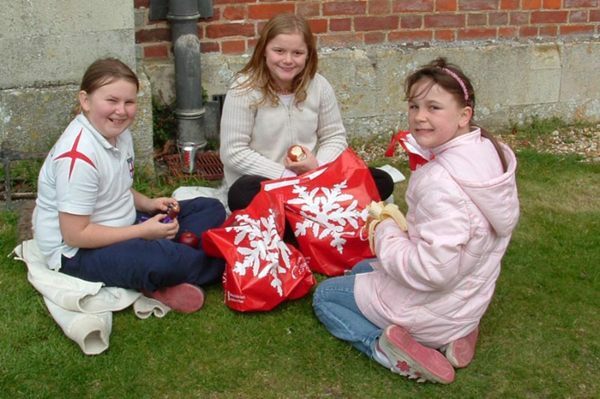 Following the event, Waitrose also agreed to do the packed lunches for 22 children and 13 adults for the day trip to Wimpole Hall on 2 April. Wonderful and unexpected support. Thank you Waitrose and thanks to Anne and all her helpers on the day. Incidently the trip to Wimpole Hall was a great success, too. 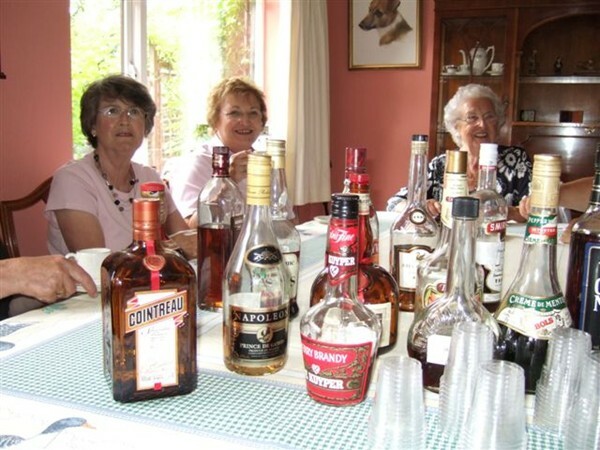 The youngsters had a great time. Thanks to Doreen and all who helped. 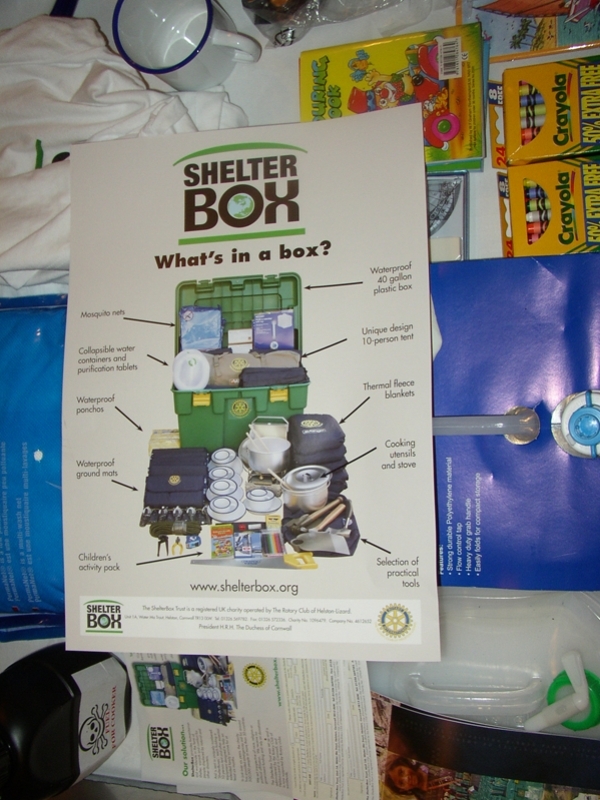 Subject: The Rotary Shelter Box Scheme for use in disasters world-wide. 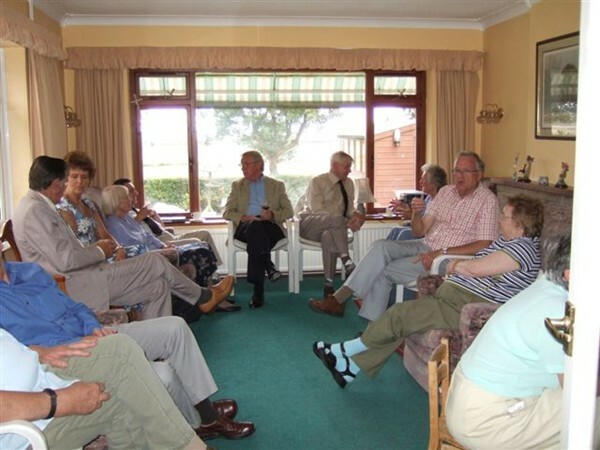 63 members and guests enjoyed an excellent evening on 28th February 2008. Chris Chew, District International Chairman, gave a talk about the charity 'Shelter Box' with a box and contents on display and a moving DVD. President Margaret presented Community Service Awards to Nancy Riach and Sam Badni for their tireless work on behalf of the Huntingdon Tennis Club. PP Geoff Burniston presented the Environmental Award to Arwen Hughes (centre) and Chris Earl, representing Papworth Trust Housing who built the delightful Victorian style terrace on the site of the old Model Laundry in Ouse Walk, tastefully designed to blend with the existing period houses. Ensembles, Groups and Choirs in the age ranges 6-10, 11-13 and 14-17.
and gave helpful advice after each section. which is to be held at Moulton School on Sunday 9th March. 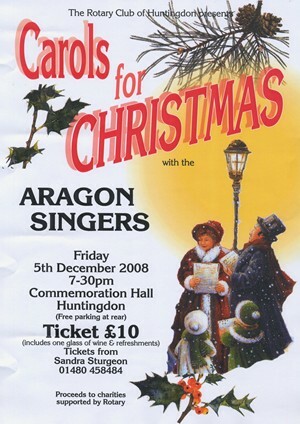 The Choir, Hinchingbrooke School Huntingdon. the Senior Solo Instrumental category. 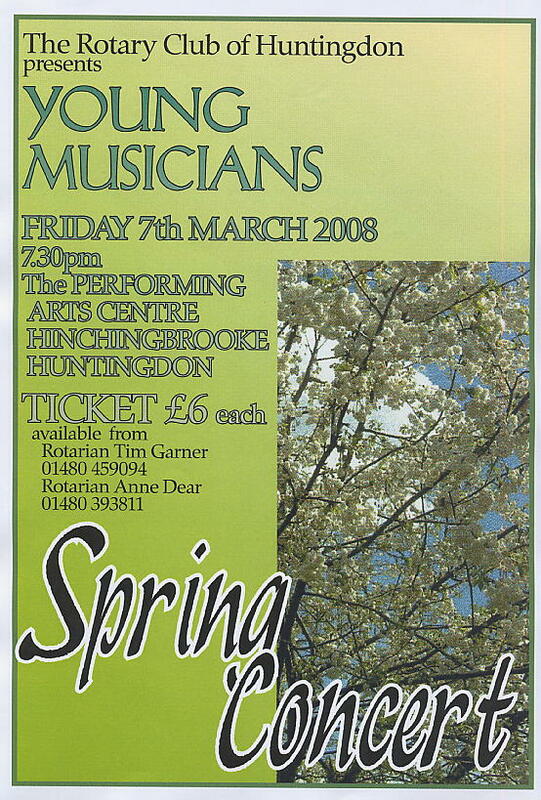 Huntingdon, St Ives and Ramsey with the support of the Huntingdonshire Music School. 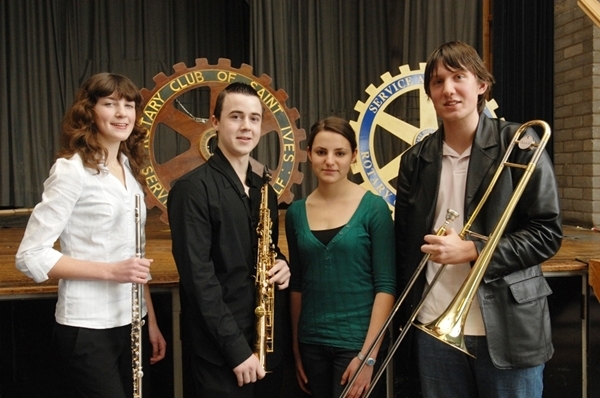 Another fine example of Rotary Youth Opportunities in Action! The following now go onto the final. 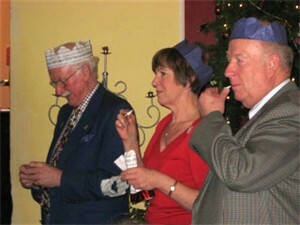 Over 50 members, friends and guests attended and had a thoroughly enjoyable evening. 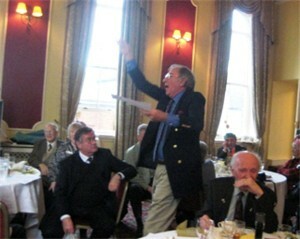 The meal was superb and the speeches both very informative and wonderfully entertaining.